As a normal course of business marketing many wig companies will give away free wigs and hair products in order to promote themselves and gain exposure. 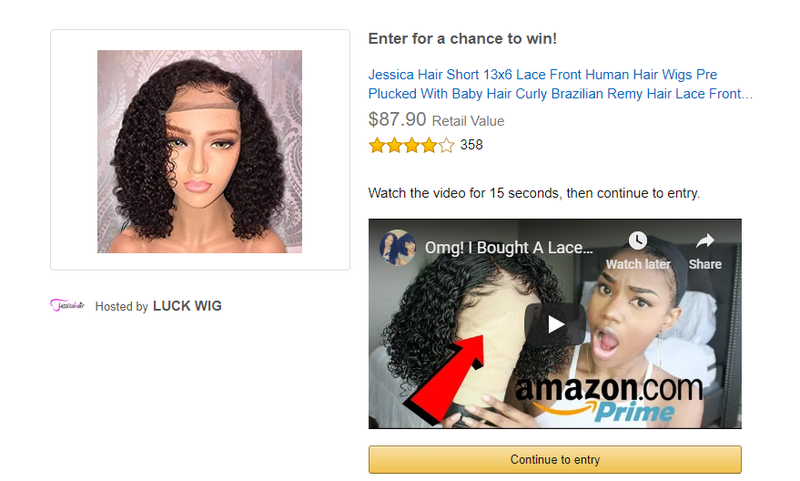 If you're looking for free wigs, a great place to start would be in Amazon giveaways. What is an Amazon Giveaway? Amazon created a platform where their users can set up a giveaway that Amazon administers and ships the prizes. Theses prizes can range in price and vary widely in the prizes. We have seen everything from Kindle Ebooks all the way up to huge TVs, Xbox consoles, bikes, and WIGS! You will need to sign up for an Amazon account in order to take part in their giveaways. Accounts are free to make and no worries if you don't have Prime. You do NOT need to be an Amazon Prime member to participate! All you have to do is scroll through and search the giveaways until you see a wig giveaway like the one below. The the person or business who is hosting the giveaway will require you to either watch a video, answer a question or simply just click to enter. The nice thing about Amazon Giveaways is that ALL prizes are shipped through Amazon. This means you know you will be getting the prize since Amazon is a reputable company.